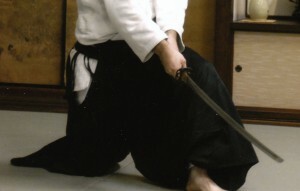 At the end of kirioroshi(vertical downward cut) the hands should be slightly below the knee. Note the angle of the sword and thigh. Even though the cut is finished, the feeling with the tip is still pressing down. Keep training! When doing the first chiburi in Inyoshintai(also known as Eishin ryu chiburi or Suhei noto[horizontal or level] chiburi), it is important to keep the blade edge to the right and the tip slightly lower than the hand so that a drop of water/blood could roll down the slope. If executing Suhei noto chiburi, one should keep the sword parallel to the ground. 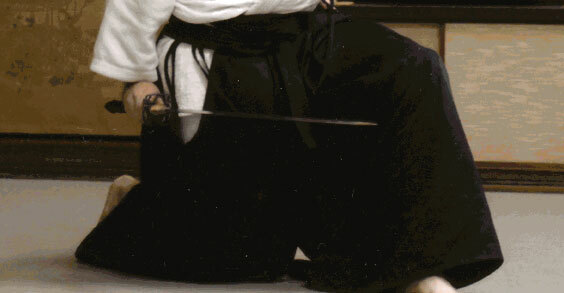 Regardless of chiburi style, the tip of the blade should always be pointed forward. The right hand should be in line with the right leg, and the feeling with the right hand, and its extension the tip, is pressing down. Keep training!